Happy New Year! I certainly didn’t expect to be here showing you a quilt top in these very early days of 2017. As much as I love sewing and quilting, I haven’t been able to find the time to sew as often as I’d like. Lately my sewing table is more a catch-all than a place to create new work. 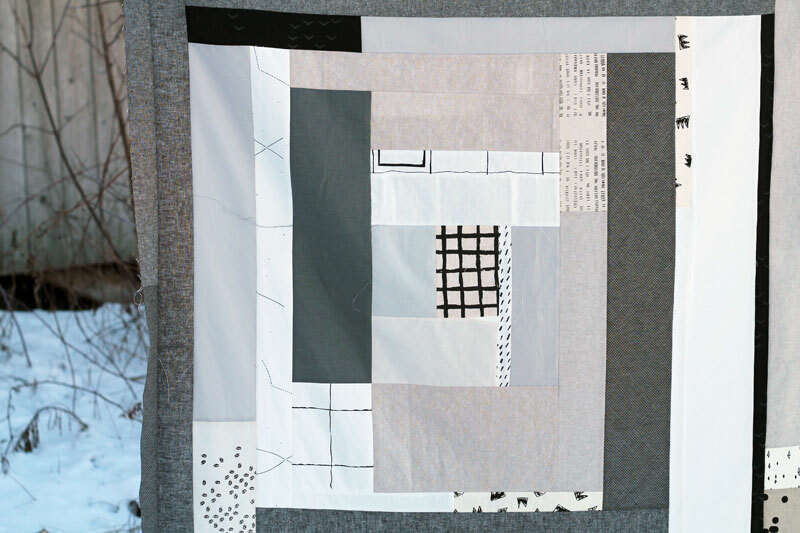 I finally decided to clean it off, and in so doing, found a pile of neutrals – a bunch of Robert Kaufman yarn dyed fabrics, a big piece of one of Carolyn Friendlander’s Euclid fabrics and a few other white/off white solids. Thanks to school vacation and Morgan being around, I was able to start this quilt. 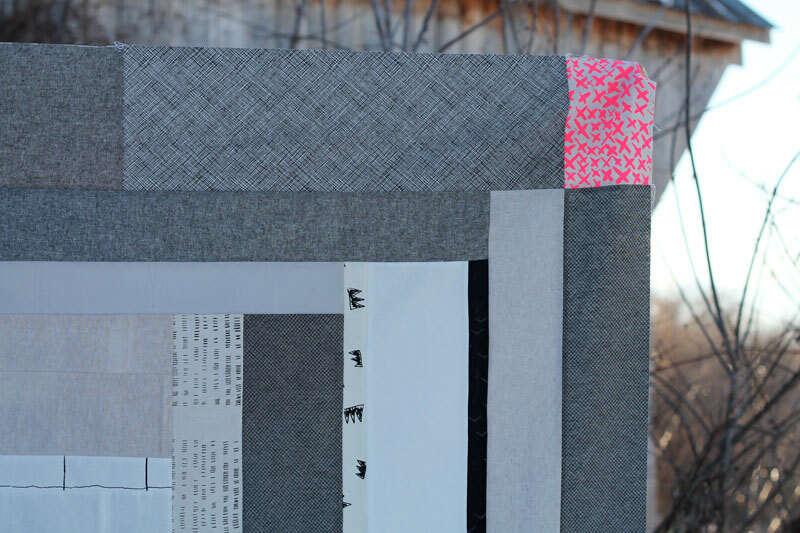 I started this neutral log cabin block, which began with a piece of hand printed fabric from Lucie Summers. I wasn’t really sure where this was going, and considered a mini quilt/wall hanging, but really felt it should be large enough to be usable as a quilt. Even as I considered various placement options for this section I had already pieced, I kept on adding strips in a somewhat log cabinish fashion. I was able to piece in a bunch of saved special neutrals – prints from Maze & Vale of course, plus some fun pieces from Spin Spin and even some long hoarded Yoshiko Jinzenji. I often think that I’m going to limit myself to just solids, or in this case, just neutrals, but truth be told, I just can’t do it. Even here, not only could I not just limit myself to just solids, but I also couldn’t even stick to just neutrals. I made it very nearly all the way, but then felt it needed something to give it a little pop – some hot pink on linen, in this case! The x print at the top is one by Lucie Summers and the pieces in the lower corner are some I purchased ages ago from Jones & Vandermeer. I’m so pleased they’ve found their way into this quilt! I hope 2017 is off to a good start for you! 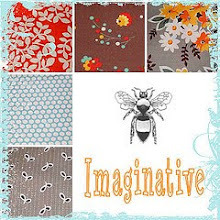 This entry was posted in Fabric, Posts about Quilts and tagged essex linen, hand printed fabrics, handmade, log cabin, lucie summers, maze & vale, neutrals, quilt top, robert kaufman, spin spin. Bookmark the permalink. 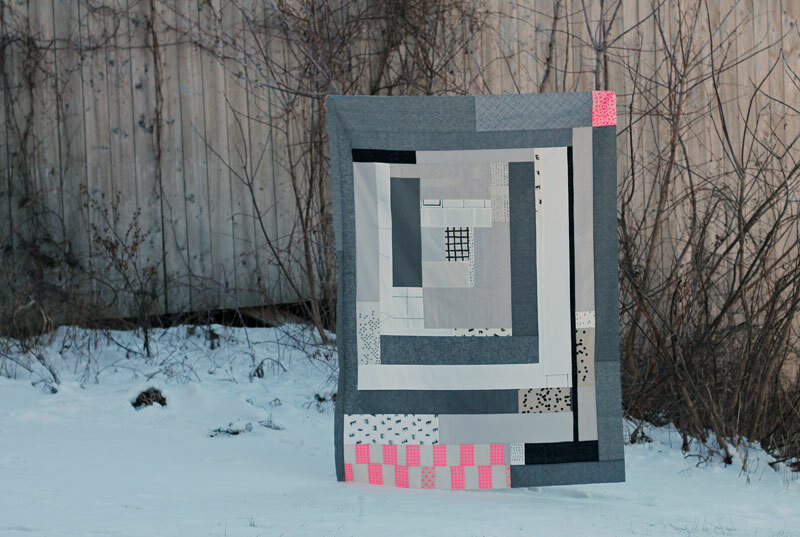 Modern, freestyle, inspiring – love this quilt! You’re off to a great start for 2017! Looks great – pink and grey just belong together. Love this one – the pop of pink is fabulous! 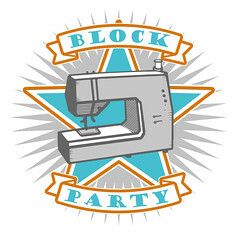 Yeah, can’t wait to see what you do with the back, and the quilting…. I love it! It’s very carefree and natural feeling in the design. I guess “organic” might be a good work for it. Way to run with the moment! Gorgeous!!!! I love absolutely EVERYTHING about this quilt top. Boy, you’re a whirlwind when you get that table cleaned off! 😎 I chuckled when you said you found some “missing” fabric when you cleaned it off. I was looking all over the place for my container of crochet hooks a few days ago, and got desperate and cleaned up a pile, er, I mean stack, of fabric on top of my gate-leg table from IKEA, which is supposed to be my cutting table….HA! I was digging through all of it, and found several pieces that I had forgotten about. I guess that means I have too much fabric??? And, I found what I thought was a large scrap of cotton batting that I could use for the “Cookies for Santa” placemats I am close to finishing for my daughter and son-in-law for Christmas last month. It turns out it was a piece of heavy flannel. It was sitting here on my desk for two days before I realized what it really was. That’s what I get for turning 70, I guess….lol. The kids all looked adorable on the post a few days ago. Max is so grown up, Hazel is adorable, and I can’t believe how big Henry is getting. Give them a hug for me. Absolutely gorgeous! Love the pops of pink! I’m an “over-planner” and would have missed out on this spontaneous and absolutely wonderful quilt. Love the pink! Don’t worry about it being predictable because the result is so charming. love it! and i’m so glad you couldn’t force yourself to stick to the plan. =) that bit of color added is what makes the quilt so fun and lovable. I love this so much, Ashley! The pops of pink are perfect! 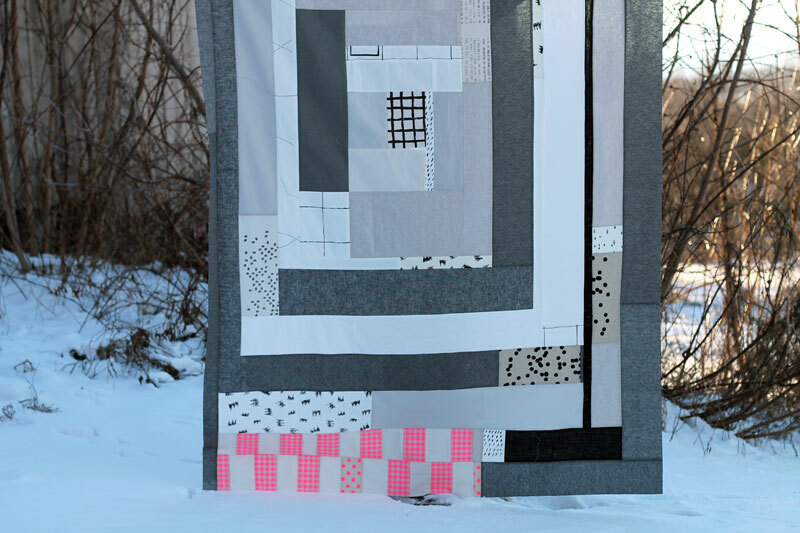 Catching up on some blog reading and love these two neutral (almost) quilts: the string quilt you framed and this fabulous one. Inspired to use some of my favourite special neutrals in this way too!